Charles R. Swindoll. Swindoll’s Ultimate Book of Illustrations & Quotes (pp. 534-535). Kindle Edition. My Money or God’s Money? Jesus, “For where your treasure is, there your heart will be also” (Matthew 6:21). Key #1: God owns EVERYTHING. I’m His Money Manager. Key #2: My HEART always goes where I put God’s money. Key #3: Heaven, NOT Earth, is my home. Key #4: I should live not for the DOT but for the LINE. Key #5: GIVING is the only antidote to MATERIALISM. “Giving is a joyful surrender to a greater person and a greater agenda. It dethrones me and exalts Him. Key #6: God prospers me NOT to raise my standard of LIVING, but to raise my standard of GIVING. Randy Alcorn is the founder and director of Eternal Perspective Ministries, a nonprofit ministry devoted to promoting an eternal viewpoint and drawing attention to people in special need of advocacy and help. Randy was a pastor for fourteen years before starting this ministry and is a popular church and conference speaker. He and his wife live in Gresham, Oregon and are the proud parents of two daughters, Karina and Angela, and the grandparents of four grandsons. Randy is also passionate about life and has written Pro-life Answers to Pro-Choice Arguments, a book that has been widely used to train students and adults to articulate the pro-life position in a secular culture. He often speaks on pro-life related themes and has included them in his novels. 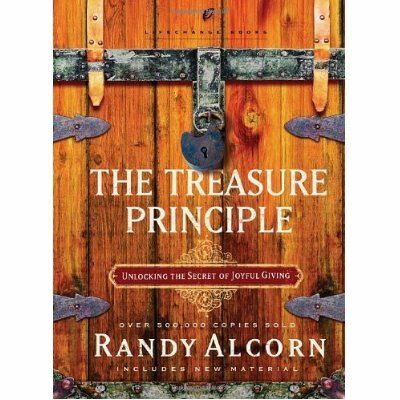 Randy’s other books include The Law of Rewards, The Treasure Principle, The Grace and Truth Paradox, The Purity Principle, Heaven, and Wait Until Then. Randy’s life emphasis is on 1) communicating the strategic importance of using our earthly time, money, possessions, and opportunities to invest in need-meeting ministries that will count for eternity; and 2) analyzing, teaching, and applying the moral, social, and relational implications of Christian truth in the current age. Visit Randy’s blog at http://www.randyalcorn.blogspot.com.